Now that the South of Scotland competition has been done and dusted for season 2016/17 South football moves into the final ties in all the cup competitions. There is only one match scheduled to be played this Saturday with Lochar Thistle and Lothian Thistle Hutchison Vale locking horns in the final of the South/East Cup Winners Shield at Lockerbie. The Haig Gordon Cup Final takes place at Kirkcudbright on Sunday where Heston Rovers play Wigtown and Bladnoch for a match that’s looks like it could go right down to the wire although the Trammondford side will start as slight favourites to win. 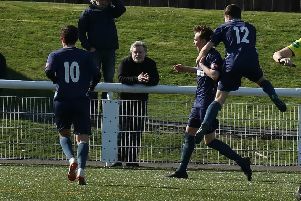 There are a further three cup ties scheduled to be played on Wednesday evening with Heston Rovers again in action when they play Mid Annandale in the second round of the Potts Cup. This is another match that looks to be evenly balanced and could take more than the regulation ninety minutes to find a winner. The other two matches are the semi finals of the Tweedie Cup with St Cuthbert Wanderers playing hosts to Nithsdale Wanderers at St Marys Park and Threave Rovers entertaining Newton Stewart at Meadow Park.